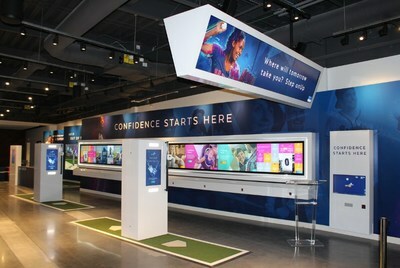 ATLANTA, March 27, 2018 /PRNewswire/ -- As fans look toward the second season of Atlanta Braves baseball at SunTrust Park, SunTrust is unveiling several enhancements and hosting events at The onUp Experience, the interactive entertainment center providing fans with baseball-inspired fun while learning about financial confidence. A simulated pitcher's mound that allows fans to test their pitching skills. A virtual reality lounge with behind the scenes footage of SunTrust Park and a mobile device charging station. A broadcast booth allowing fans to watch the live pre-game coverage from 680 The Fan. An interactive display with access to onUp.com where visitors can get free financial tools, tips and resources to better manage their money. "The onUp Experience is a way to encourage Braves fans to take a step toward financial confidence while having a good time at SunTrust Park," said Susan Somersille Johnson, SunTrust chief marketing officer. "More than 33,000 people visited The onUp Experience last year. Our venue connects finances, fun and baseball." SunTrust will also host several special events in The onUp Experience during Opening Weekend to welcome visitors to SunTrust Park. Legendary Manager Bobby Cox will greet fans and sign autographs on Friday, March 30 from 5:30 p.m. to 6:30 p.m.
"The Lost Moola" kids comic book giveaway on Thursday, March 29 from 11:30 a.m. to 2:30 p.m. and Saturday, March 31 from 4 p.m. to 7 p.m. Located on the main pedestrian walkway to the ballpark entrance at 800 Battery Avenue SE, Suite 110, The onUp Experience is named after the onUp movement, which has already helped more than 3 million people take steps toward financial confidence so they can enjoy the moments in life that matter. Learn more about The onUp Experience at https://onupmovement.suntrust.com/onupexperience/. SunTrust Banks, Inc. is a purpose-driven company dedicated to Lighting the Way to Financial Well-Being for the people, businesses, and communities it serves. Headquartered in Atlanta, the Company has two business segments: Consumer and Wholesale. Its flagship subsidiary, SunTrust Bank, operates an extensive branch and ATM network throughout the high-growth Southeast and Mid-Atlantic states, along with 24-hour digital access. Certain business lines serve consumer, commercial, corporate, and institutional clients nationally. As of December 31, 2017, SunTrust had total assets of $206 billion and total deposits of $161 billion. The Company provides deposit, credit, trust, investment, mortgage, asset management, securities brokerage, and capital market services. SunTrust leads onUp, a national movement inspiring Americans to build financial confidence. Join the movement at onUp.com.